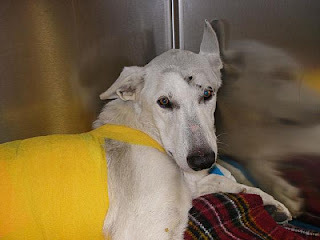 Gideon, a white German Shepherd was found after being anonymously reported to the Santa Ana Animal Control – he was found in a park after being hit, dragged and left by a car and it’s driver at the park. Gideon is being treated for excessive skin loss, however he is a gentle dog who greeted those who found him with a wagging tail, grin and attempted lickings to show his appreciation for finding him. Other rescue groups and individuals are helping Gideon (named because it means strength) recover after his horrific ordeal. He is being called “Gideon the Miracle Dog”. Uno the Wonder Beagle has now been given his own day in his home state of Illinois in March. Uno is also the first dog to be celebrated at the White House as Champion of the Westminister Kennel Club Show. Before the U.S. election the First Lady – Laura Bush, gave him a special collar bearing red, white and blue stripes. Portland, Oregon – a man is recovering after a bizzare accident caused by his three-year old Labrador named Drake. Drake jumped into their eleven-foot open aluminium boat as Matthew Marcum’s son Henry was about to tie up the boat at the dock. When Drake jumped in he set off Matthew’s twelve-gauge shotgun which hit Matthew’s legs and buttocks. Matthew was taken to Legacy Emanuel Hospital & Health Centre in Portland. His recovery is going smoothly. Matthew said that his dog is a good dog and that he is in no way upset with him. In Ontario, Canada, two teens attempted to strangle a Police Dog. The dog is fine and was only injured to the point of unconsciousness. Another police dog called Quincy, was set onto the scene and found the perps. The injured dog is called Cezar, who originally set out to find both perps after a car was found driving around erratically at 11:30 that night before two male youths left the car and fled into the woods. Cezar was attacked by the youths as he searched for them. Quincy was then sent to find them and eventually did. One of the youths then attacked Quincy by punching him, officers came and arrested this youth and the other was found hiding beneath a bush. Both police dogs were taken to Walker Road Animal Hospital, Cezar regained consciousness and was found to have no injuries. Both youths face multiple charges. Port Jefferson man’s dog crashes van into coffee shop. Bryan Maher – 60, left his 1992 Chevrolet van running whilst he went into the coffee shop Cool Beanz. As he did this, he left his dog Bentley unattended and Bentley somehow put the car into drive. The van rolled forward and into the building. Nobody was hurt, patio furniture on the sidewalk was damaged and the coffee shop itself was also damaged. Cool Beanz owner Patricia McCarthy said “Luckily it's only property that we have to repair, and not a person,” about the accident. No charges were filed against Bryan Maher and his inquisitive dog Bentley. Russell Rigby was saved by his fourteen-month old dog named Jake. "You've heard the story about one man and his dog, that's me and him." After he was woken up, he raised the alarm of the fire itself and explained that he didn’t want the entire caravan park to go up in flames so he disconnected the gas straight away. Rigby believes his heater may have started the fire. His caravan had no smoke detectors installed so it was the heroic efforts of young Jake that saved his master. By the time firefighters arrived, the caravan was completely engulfed and soon burned to the ground, leaving Rigby with nothing but his life and his four-legged friend.